The global trade in illegal pesticides is growing, evidenced by the increase in the number of seizures and incidents around the world related to such products. The increase is not only due to better awareness by controlling authorities of the phenomenon, but also to the fact that nowadays the illicit actors involved in the production and distribution of these goods operate on a global scale. Following a 12-day operation organized by the European Police Office (EUROPOL) in November 2015, 100 cases of infringements were detected during 350 inspections at major ports and airports in seven European Union (EU) countries. At the Port of Rotterdam alone, Dutch Food and Consumer Product Safety Authority (NVWA) officials and Customs officers inspected eight shipments, six of which were found to be suspicious. Pesticides are one of the most regulated products on the market. In most countries, pesticides must be registered by a national government agency in charge of determining whether the pesticide meets the safety standards in force before it can be sold. The approval procedure is long and costly, typically taking 10 years from the moment of discovery to the first sale, and could cost as much as 280 million euro. There is a reason why laws regulating pesticides are strict. Pesticides are designed to harm or kill pests, such as insects, fungi and weeds. In addition, as these pesticides are released over land, water and food crops, people and wildlife may be exposed to them. Furthermore residues enter the food chain and can accumulate, and sometimes the chemical substances may pose a threat to beneficial insects, such as bees. They can also do harm to the direct user and even to crops themselves if not used strictly in terms of their label, such as the wearing of appropriate protective clothing. New generations of pesticides are highly specific, targeting just one pest in a crop, while others, mostly older generation pesticides, have a broad spectrum. The older generation pesticides are banned from use in many countries. They can’t meet the requirements for approval. Illegal pesticides refer to both counterfeit products and pesticides that are not registered in the country of destination. These ‘non-authorized’ pesticides pose a greater risk as they may have a much higher level of toxicity than legal products. For example, they may not have been evaluated by a government agency to ensure that their use will not harm people or the environment, and they are often sold without proper usage directions or warnings on the labels. As for counterfeit pesticides, they are usually packaged to look like legal products, but their contents may not match their labels. For example, they may have less of the active ingredient than the legal product, or they may contain cheaper, possibly more toxic, active ingredients. Thus, counterfeit pesticides may either be useless (not achieving their expected intention) or highly dangerous (containing excessive poison), while still being toxic. In many countries, agriculture is the cornerstone of the economy. Therefore, the stakes are high – contaminated products may be banned from markets, including export markets, crops may be damaged, and farmers brought to ruin. In Northern India in 2015, farmers launched a strike to demand a judicial probe into the sale of counterfeit pesticides that damaged their crops or rendered them worthless. There are several reasons that explain why the trade in illicit and counterfeit pesticides has increased over recent years. The demand for cheap pesticides is high; broad spectrum pesticides are increasingly being banned in many markets across the world, profits are high, and the probability of detection is low. Enforcement in this area is indeed complex. Besides criminal networks whose operations entail the use of complicated and deliberately long supply chains (products crossing many borders of different countries) and fake documents, there are also smaller operators – sometimes just a few individuals – seeking a quick win. In addition, direct sales of pesticides to farmers are a common occurrence. As awareness of the trade in illicit and counterfeit pesticides is growing around the world, the key to success in combatting this crime is to combine knowledge from competent authorities and industry, as well as from countries throughout the world. Customs, most especially, has a pivotal role to play in detecting illicit and counterfeit shipments of pesticides. In cooperation with regulatory bodies and/or police forces and public prosecutors, cases can be successfully brought to court, creating a deterrent effect on criminals, and preventing illicit pesticides from entering the market and the food chain. In countries that are successfully dealing with this phenomenon, cooperation between government agencies within and across countries has been the key to their success. In the Netherlands, the NVWA enforces regulations related to pesticides. The NVWA works together with Customs, the Police and the Public Prosecution Service (OM) to prevent non-authorized pesticides from reaching the market. All the parties involved use Customs communication channels to exchange information. Control activities focus on the Port of Rotterdam and Schiphol Airport, the country’s key hubs. Once these illegal goods make it onto the market they are much harder to control. The NVWA is responsible for defining risk profiles and feeding indicators into the Customs automated risk management system. Indicators refer to the presence of an active substance, to the use of a description for the goods known to be used for illegal pesticides, and to the names of importing companies. These indicators are regularly updated, following a positive inspection by the NVWA and Customs for example. Customs has a central role in coordinating combined inspections of pesticide shipments. Shipments that are selected by the risk management system are inspected by both agencies, with Customs controlling whether the consignment is properly stowed, as well as ensuring that there is no infringement of intellectual property rights (IPR). By coordinating inspections and ensuring that only one physical check is carried out, Customs enables time loss in the logistics chain to be minimized. The NVWA communicates the outcome of its inspection to Customs, in order to ensure that a shipment is not released. The bonus of the one check principle is that all involved partners benefit from each other’s knowledge and expertise. If required, the NVWA can provide training to Customs officials. Cases of deliberate illegality include mislabelling (wrong name, spelling mistake, unapproved label format, etc. ), misbranding (leading to patent or trademark infringements), undesirable composition, use of wrong active ingredients or co-formulants, the presence of impurities that are cause for concern, unsuitable bottles or containers, and obsolete pesticides. Importations of pesticides must be controlled by inspecting the supporting documentation, by visually checking the packaging and labelling, and, in cases of suspected contraband, by sampling and performing a laboratory analysis. The use of false declarations and falsified documents is common practice among smugglers of illicit pesticides. Most illegal products would not be declared as ‘dangerous goods,’ the shipping documents would be unclear, and fake/fraudulent names and misleading/deceptive labels would be used. In addition, the shipping documents may refer to a different pesticide than the one actually being transported, and contain a different active substance, especially when the real active substance is still under patent. Analysing the packaging is of utmost importance. The transport of dangerous goods is regulated to ensure the safety of workers and operators, of the vehicle used to transport them, and of other goods being transported. Therefore, the packaging has to meet certain standards defined by the United Nations (UN). International agreements for the carriage of dangerous goods require packaging to be of a design-type certified by a national competent authority. This involves testing the packaging against the appropriate UN specification to ensure its suitability. Such packaging is often referred to as ‘type-approved,’ ‘UN approved’ or ‘UN certified’ and marked in a particular way, prefixed by the UN logo and followed by codes. The UN marking system indicates several characteristics of the packaging, as well as information on the test levels the packaging has successfully passed. Because these test levels are related to the hazard level and physical/chemical characteristics of the substance, the markings also indicate some of the properties of the materials that may be packed in each container. It also indicates the country where the container was manufactured, as well as the manufacturing plant. As most pesticides are classified as dangerous goods, closely examining the packaging will be crucial during an inspection. 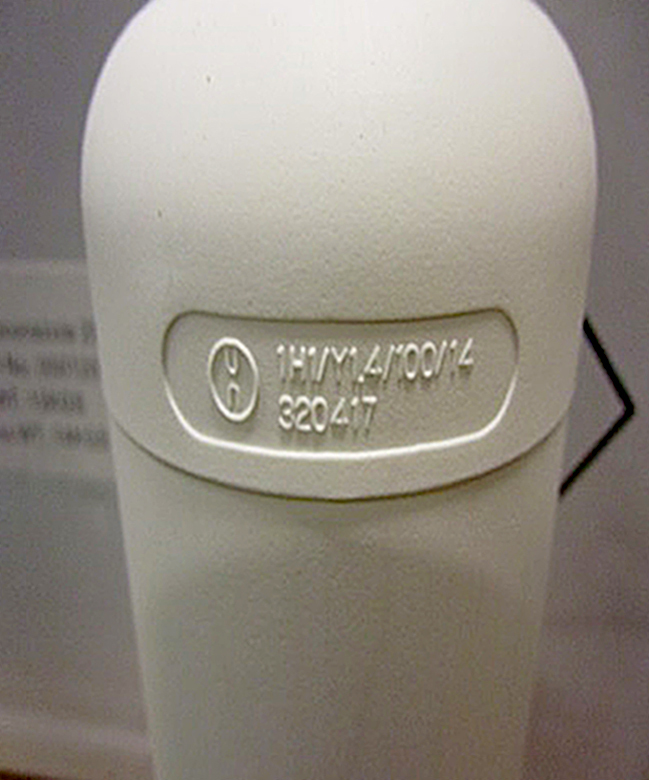 It has been found that UN markings on the canisters are sometimes incomplete or even absent. On picture 1 for example, the country code is missing, as well as the producer’s initials, always represented by the last digit at the end of the code. This gives a lead as to whether the shipment is legitimate or not. It is common to find packaging material that is not adequate for the retention of pesticides, and could be an accident hazard. Shipments containing pesticides should be stored and stowed in specific designated positions on a vessel, but due to deliberate false declarations, these conditions are often not met. Dangerous cargo with sometimes very low flashpoints of <20° Celsius could be on board a vessel without the necessary warning signs. Design and trademarks on the packaging of big brands are often copied in an intentionally unobtrusive manner. Picture 2 shows the bottom of a five litre canister – there is no UN code, and there is a visible infringement of the Syngenta’s Spac® trademark. In some cases, the trademarks are indicated on separate parts of the packaging, as shown in picture 3. In this case, the intellectual property (IP) right only applies to the bottle’s cap, which is for measuring purposes. 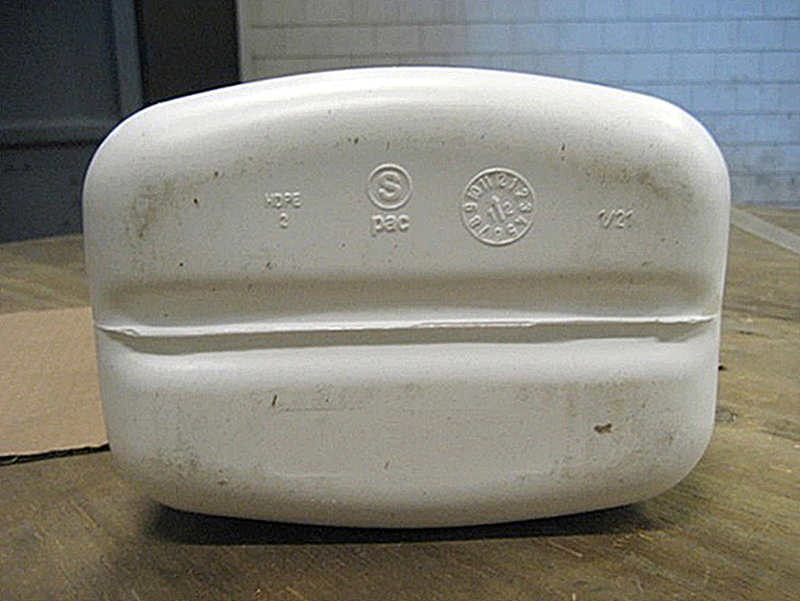 Only the caps could, therefore, be detained – it is worth noting here that trademarks should be used on all packaging in order to better protect goods. Nevertheless, as the bottle contained a non-approved pesticide, there was a violation of the law regulating pesticides. As mentioned earlier, checking cargo and detecting infringements requires the intervention of laboratories that are able to undertake rapid chemical analyses. Thus, an efficient system of Customs laboratories that are fully equipped and able to analyse pesticides in line with internationally accepted methodologies must be in place, together with mobile laboratories to carry out express pesticide testing. The necessity for countries to cooperate is evident. If a shipment has been detained at one port of entry, smugglers will divert their products from it, and try to enter them through another port. This logic is commonly referred to as the ‘waterbed’ effect. For the same reason, any decision to return illegal pesticides to an exporter should be avoided if possible, because the high profit margins realized when selling such goods results in these shipments usually being re-sent to other countries. To enhance cooperation, international enforcement operations are helpful, such as the one organized by EUROPOL. Another interesting initiative is the Network of Officials for Pesticide Compliance and Enforcement (NOPCE), created and managed by the Organisation for Economic Co-operation and Development (OECD). Members of the NOPCE – pesticide regulators from OECD and non-OECD countries – use a system to inform other officials on the arrival of non-authorized and possible illegal pesticides. Besides enhancing the exchange of information, another challenges for government agencies and the industry in the future is the capacity to react to illicit traders’ new importing methods. There is a risk, more specifically, that instead of importing formulated products (pesticides in the form of a ready-to-use formulated product) they would turn to ‘technical substances,’ and produce the ready-to-use product in the country of destination. At present, in some countries the importation of technical substances is not as strongly regulated as ready-to-use pesticides.